Pigeons are sometimes known as flying rats – and not without reason. Some experts even believe their breeding and sanitary habits means they carry more diseases than rodents do. Essex and Suffolk Pest Solutions are specialists in pigeon control in Colchester, Witham, Clacton, and many other locations throughout Essex and Suffolk. Here are some of the principal threats they pose – and why we can help eradicate them quickly and effectively. It’s all too easy to spot which buildings have been infested with pigeons. Droppings on the floor, damaged furniture and nests in the rafters are all tell-tale signs that you have a bird control problem. While it can be an irritating nuisance for homeowners, the problems are magnified for businesses. The presence of nuisance birds like pigeons can hit your company’s bottom line, as they damage your reputation and could put your premises out of action while the problem is dealt with. Many modern public buildings are particularly vulnerable because they have food concourses which are very attractive to feral, or wild, pigeons. There is a continuous supply of food and waste, and there are plenty of ledges for them to perch on. E.coli – this is caused by bird droppings landing in a water or food supply which is then consumed by humans. This leads to sickness and fever. Salmonella – commonly known as food poisoning, it is spread by droppings turning into dust and contaminating food preparation surfaces. Psittacosis – this is transmitted from birds to humans by inhaling the dust of contaminated material such as dried faeces or feathers. Symptoms include fever, headaches and muscle pain. 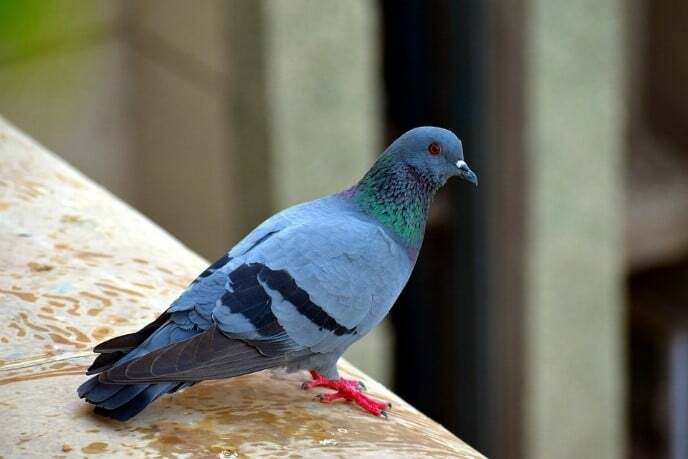 Histoplasmosis – this is a respiratory disease caused by a fungus which grows in pigeon droppings. In extreme cases it can prove fatal. As well as encouraging the spread of diseases, pigeon droppings also create other problems. Pigeon poo is highly acidic, stains the surfaces it has been dropped on and can be very difficult to get rid of once it has dried out. The birds use it to reinforce their nests so that they last through the winter. Pigeon nests and droppings can also act as a magnet for other pests, particularly when they are present for long periods of time. They can build nests on their droppings and this means they often become carriers of bird mites. This tiny insect feeds off the pigeon and, when transmitted to humans, leads to itching and scratching. The birds also carry a variety of other pests, such as ticks, bed bugs, lice, cockroaches, carpet beetles and clothes moths. Some of these can remain in a nest even after the pigeons have left. A well-planned installation of effective bird control measures will help to cut nuisance and fouling, and will maintain safe, hygienic and pleasant public amenity areas. Essex and Suffolk Pest Solutions will first carry out a survey of the affected site to determine the size of the feral pigeon colony and how much damage it has done to the building. We can use discreet, unmarked vans if required. We then remove all the nests and droppings, and thoroughly treat the building with biocides to kill any bacteria and viruses. The next step is to make the site pigeon-proof, which can be achieved through installing bird wire, spikes, netting or fire gel. This last option makes the birds think the area is on fire, encouraging them to find somewhere else to nest. If this is not practical, then we would consider eradicating them via a series of humane culls, which would be carried out by a trained marksman. If you would like to know more about Essex and Suffolk Pest Solutions’ methods of pigeon control, you can contact us by following this link. We operate in Colchester, Clacton, Witham, Newmarket, Felixstowe, Harwich, Ipswich and other locations across Essex and Suffolk, providing services including wasp control, rodent control and bed bug extermination.